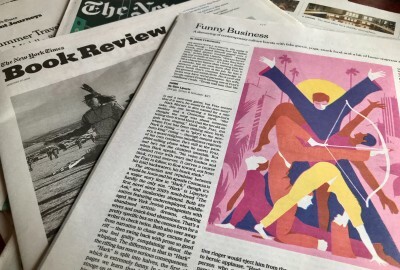 Park alumni Ruth Franklin '91 and Josh Tyrangiel '90 are both reviewers in the January 27 edition of The New York Times Book Review (pages 9 and 10). Franklin ’91 is a book critic and former editor at The New Republic, and an Adjunct Faculty at the NYU Arthur L. Carter Journalism Institute in the Cultural Reporting & Criticism Graduate Program. She has written for many publications, including The New Yorker, Harper’s, The New York Times Book Review, The New York Review of Books, and Salmagundi, to which she contributes a regular film column. She is the recipient of a Guggenheim Fellowship in biography, a Cullman Fellowship at the New York Public Library, a Leon Levy Fellowship in biography, and the Roger Shattuck Prize for Criticism. Her latest book, Shirley Jackson: A Rather Haunted Life, (Liveright/W.W. Norton, 2016) won the National Book Critics Circle Award for Biography and was named a New York Times Notable Book of 2016, a Time magazine top nonfiction book of 2016, and a “best book of 2016” by The Boston Globe, the San Francisco Chronicle, NPR, and others. Tyrangiel ’90 is the Senior Vice President of News at Vice Media and Executive Producer for Vice on HBO and Vice News Tonight on HBO. Before moving to VICE, Tyrangiel was the editor of Bloomberg BusinessWeek, overseeing all content on Bloomberg’s media platforms. He had previously overseen the rebranding of BusinessWeek when it was acquired by Bloomberg L.P. and led the editorial vision of the magazine. Earlier in his career, Tyrangiel worked at Vibe and Rolling Stone magazines and produced the news at MTV. He then joined TIME magazine and worked as a staff writer, music critic, and London correspondent and national editor, and was promoted to deputy managing editor.